How Do We Like it Now? Outdoor Edition. Over the past 4 years, we’ve both documented just about everything that has happened within our homes. 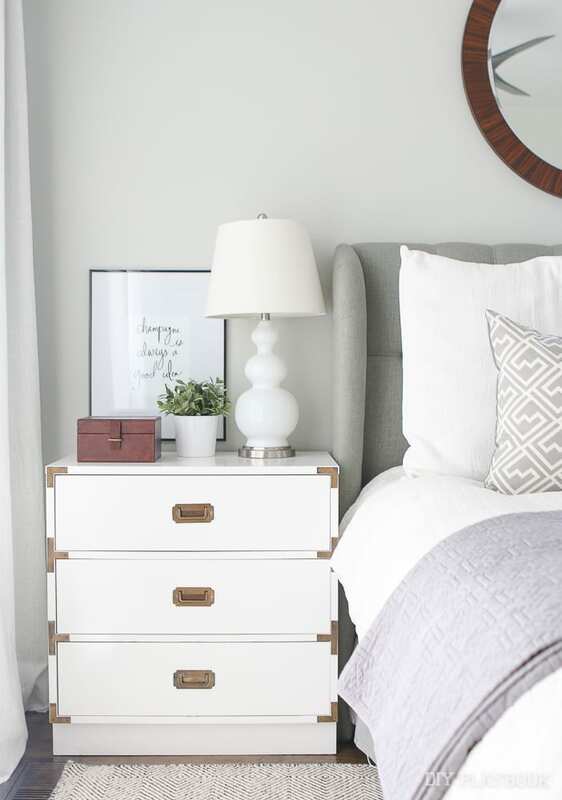 From DIY projects to new furniture purchases…you guys have seen it all! Today’s focus? 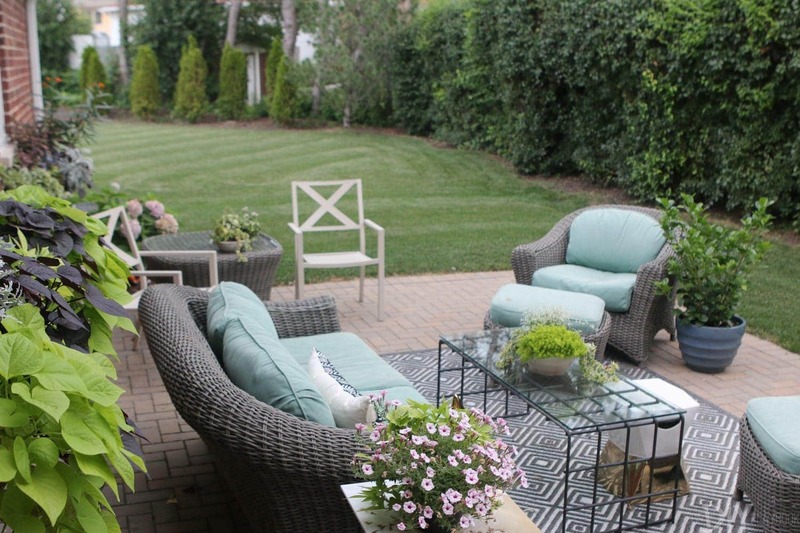 Outdoor projects and furniture choices! When I saw our balcony for the first time, I never thought I’d be able to put much out here. 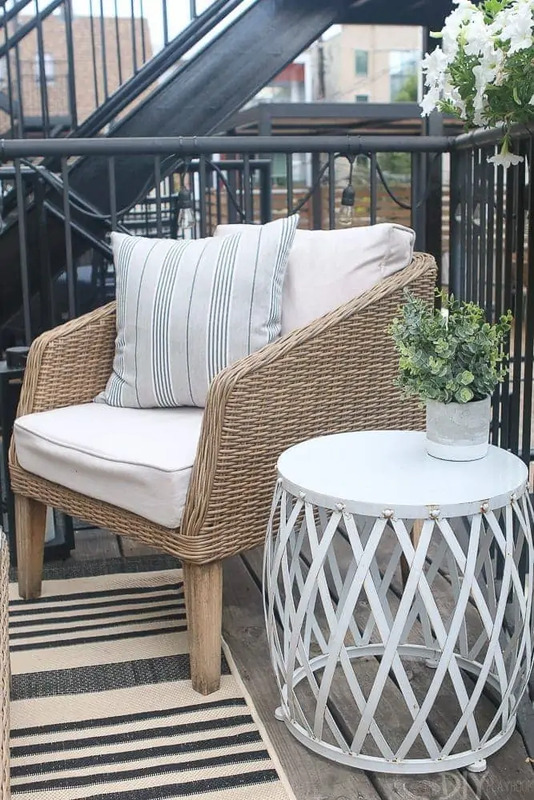 But I was pleasantly surprised when I added this small patio set from Wayfair out here to create a little conversation area. Based on the size and setup…I’d give this a 10 out of 10! It works just perfectly and we really maximized the space. 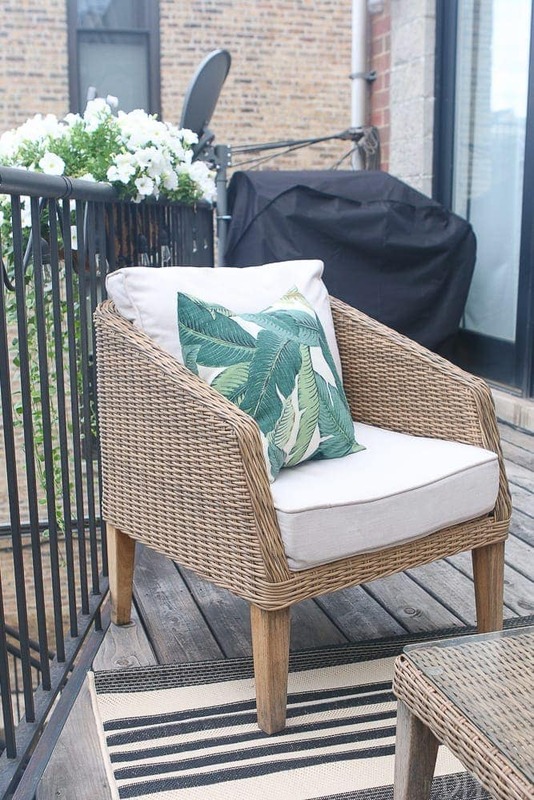 But when it comes to the actual patio set, I’ve gotta dock some points because the wood on the legs has not held up very well over the past 2 years. Of course I have left it out here all winter long (covered), so I shouldn’t be too surprised that the wood isn’t looking so good. But there is some noticeable staining on the wooden legs and it’s gotten really dry. 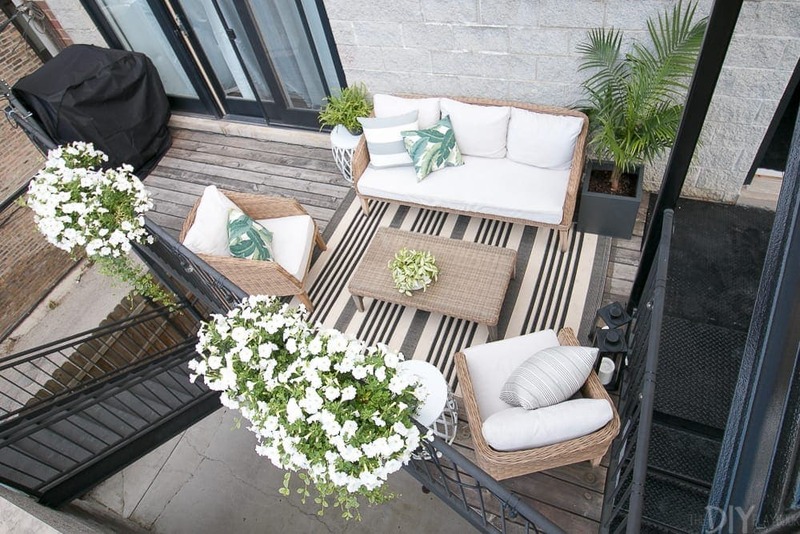 Besides that, this patio set still looks pretty great and the cushions are still bright and comfortable. I think spraying the cushions with water shield spray, definitely helped protect them too. 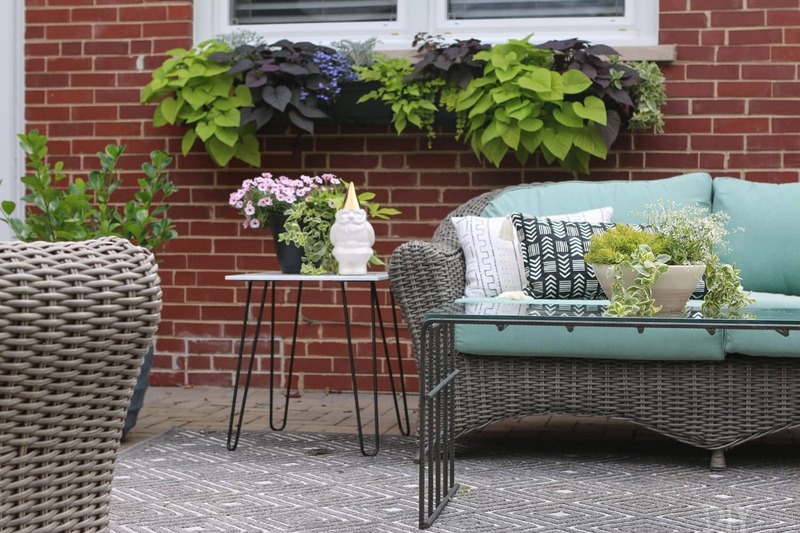 My plan is to do a complete patio update post on Monday (to chat all about our new rug and some of the updated planters out here! ), so I’ll dive in deeper at that time. 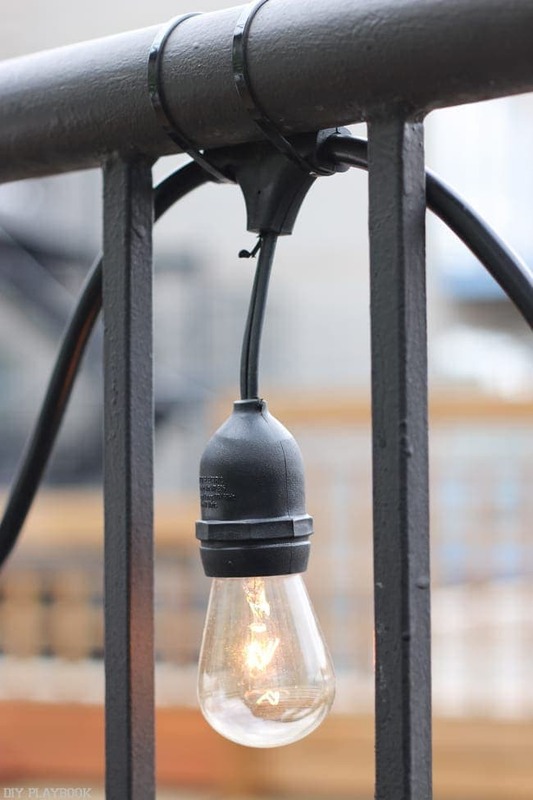 Right when we moved in, we added these string lights to the railing on our balcony. We got the lights from Costco at a pretty good price. Fast forward 2 years of these lights hanging 24/7 and they still look brand new! Even with winters and thunderstorms, they’ve stayed perfectly fine out here. Not one broken bulb! We zip tied them all along the railing and they’re incredibly secure. This year we even added a timer to the plug, so they automatically go on at night, and off when we go to bed. 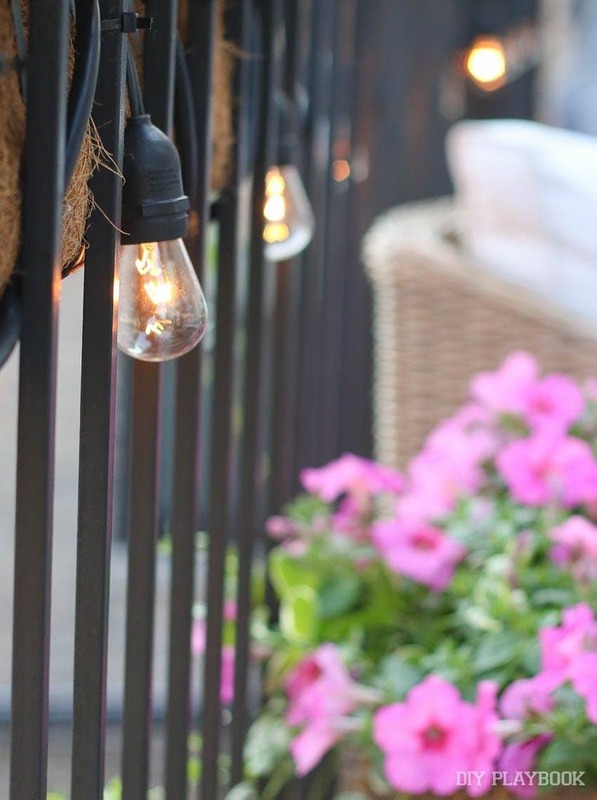 I never thought these string lights would hold up so well out here or that I’d love the ambiance they create so much…therefore they get a 10 out of 10! 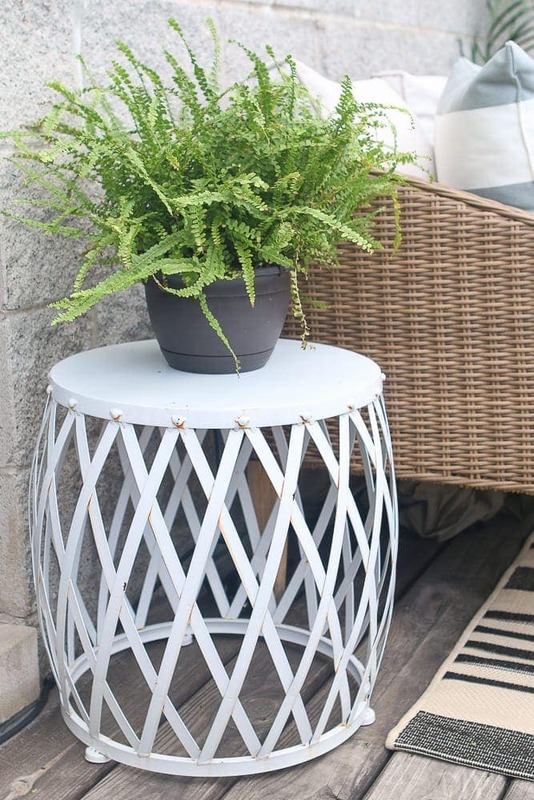 Last year, I found these 2 white garden stools at HomeGoods to add to our patio. 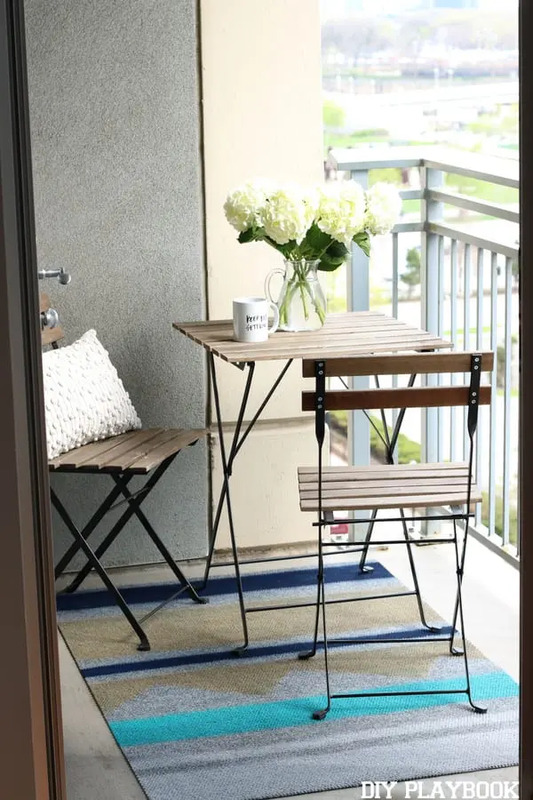 They’re the ideal size to use as a side table, or when we have a lot of people out here we use them as an extra seat! In terms of function, they’re spot on! But sadly they’re not holding up too well because of being out here in the elements. The metal is starting to rust and it’s not looking too pretty against the white. They’re weren’t super expensive, so in the long run I’m okay with it. But I do wish they weren’t rusting quite so bad. Anyone have any tips for dealing with or preventing rust? 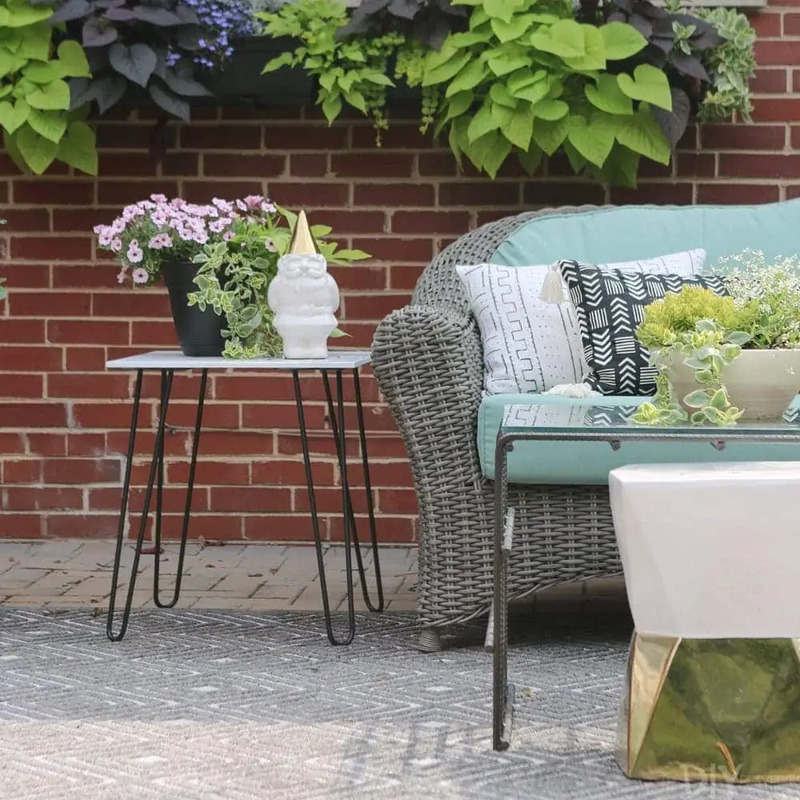 We love entertaining out here and get SO many compliments on the furniture, but I’m just not obsessed with the matchy-matchy look and don’t love how bulky this furniture is. Granted the bulky nature of the furniture does make it extra cozy, which I appreciate, but overall the look isn’t totally “me” anymore. I feel bad grading this set so low because the grade doesn’t reflect the furniture itself, it’s just not my exact style anymore. In terms of quality, this set deserves a 10 out of 10. We bring it in for the winter, but leave both the cushions and the furniture out all season long. We used to bring the cushions into the garage when the forecast said rain, but we’ve gotten a little lazy over the years. The great news is that both the cushions and the furniture look pretty darn awesome considering all the elements they withstand. 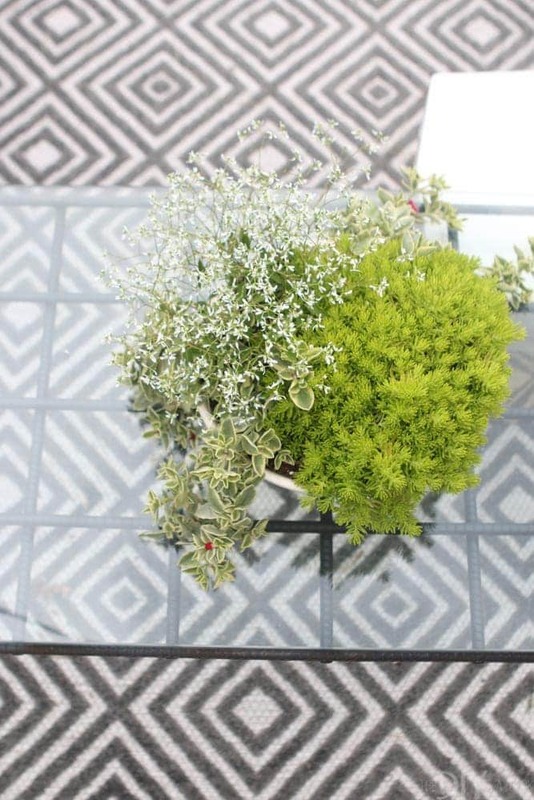 I just can’t seem to get my act together when it comes to outdoor rugs and feel like I keep striking out! I learned from last year’s rug that although I may love a bold rug in photos, adding one into my house and living with it everyday isn’t my personal style. Ya live and ya learn, right?! I have found over time that spaces that are most “me” are ones where the rug is neutral and not super loud. So this year I ooohh-ed and aahhhh-ed at the bold/colorful options (which seemed like almost all of them in the outdoor rug world) but opted for something more neutral to actually buy. 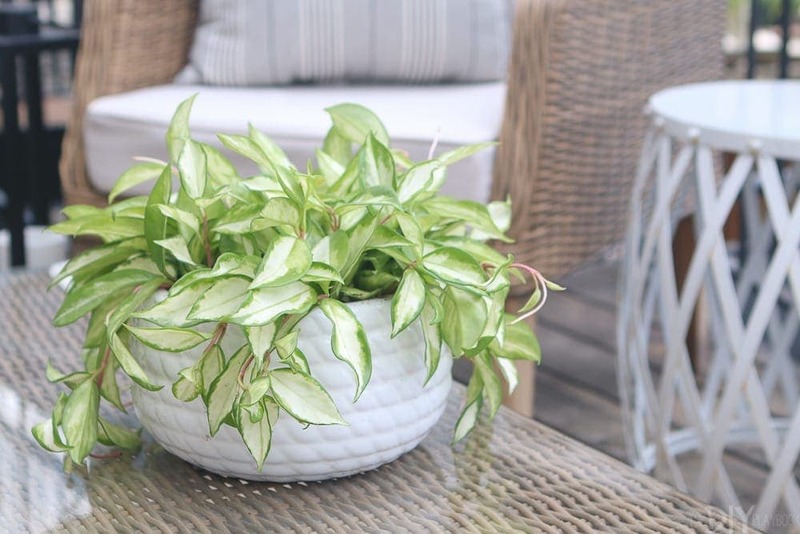 I settled on this indoor/outdoor option during a Memorial Day super sale. 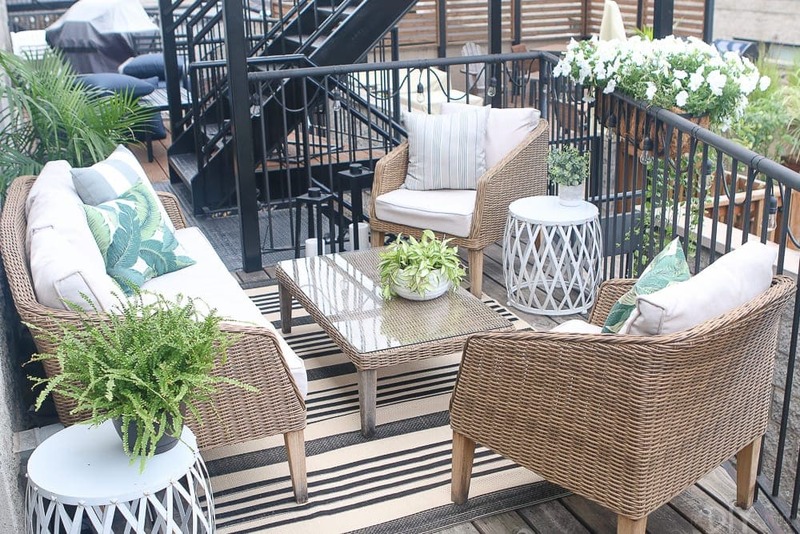 Although I love the rug itself, I blanked on the fact that the wicker on my patio furniture is also gray, creating a matchy-matchy issue that I’m not obsessed with. 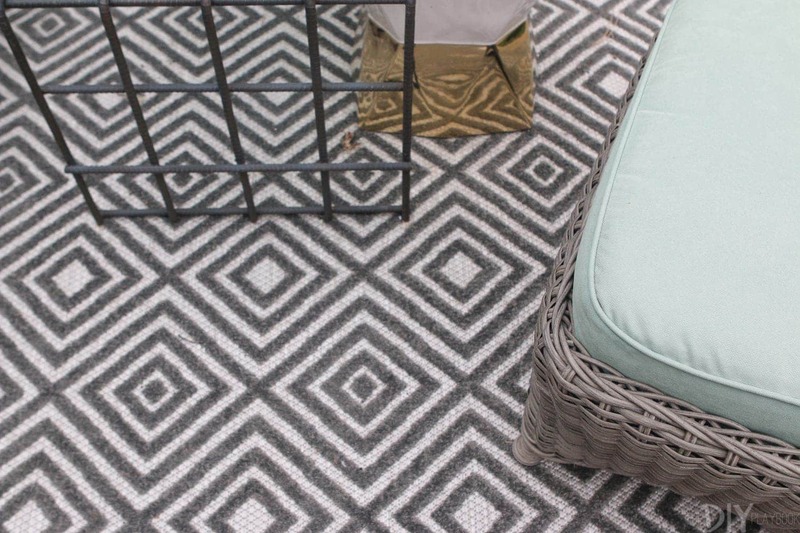 The rug itself has held up really nice for being an indoor/outdoor rug and brings some great texture to the space, so I would grade the actual product a perfect 10. But my LOVE for the look brings my overall decision down to an 8 out of 10. It’s a lesson learned… again! If you remember from a few years ago when I installed these window boxes, this was not the easiest project ever. Actually it was SUPER frustrating because drilling into the brick/mortar under each window was HARD. Then making sure these holes were level to hang the flower boxes was even HARDER! But I’m happy to report that after that hard part was over, I’ve been head-over-heels in love with the boxes ever since. 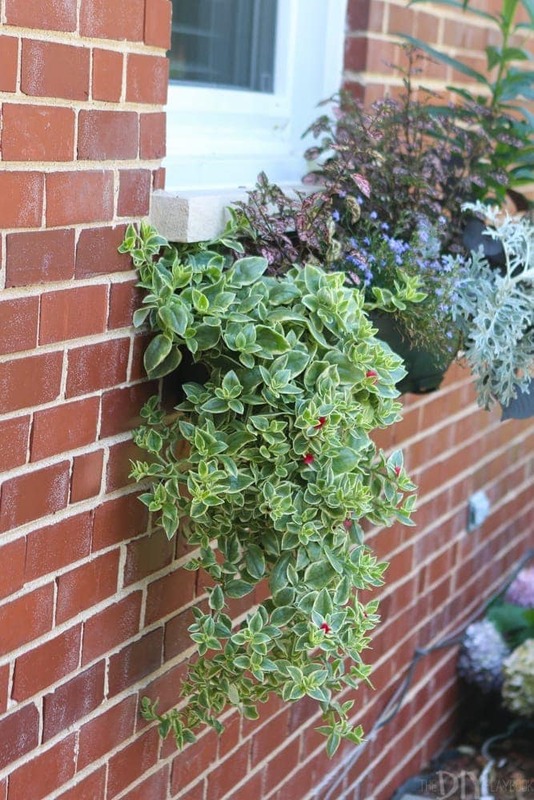 We tested a few different variations of plants over the years and have finally seemed to find the mixture of plants that works best on each side of our house. Finding out what works keeps our watering schedule fairly low maintenance and the boxes are always thriving throughout the summer/early fall. I do want to note that since hanging the boxes, I have replaced a few (which isn’t bad at $10 a box). And have also re-spray painted a few boxes that chipped after a few seasons of wear and tear. Other than that, these flower boxes get an A+ in my grade book! 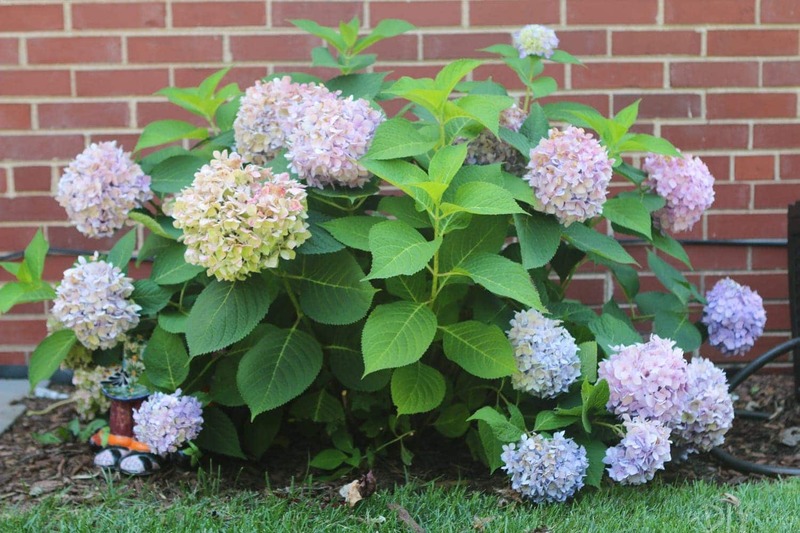 Planting hydrangeas in our backyard was another one of my favorite outdoor “projects”. We planted 5 large hydrangea plants about 4 years ago and have loved them ever since. Other than cutting them down after winter and watering them often, we don’t do much to these plants, yet they still provide gorgeous blooms. 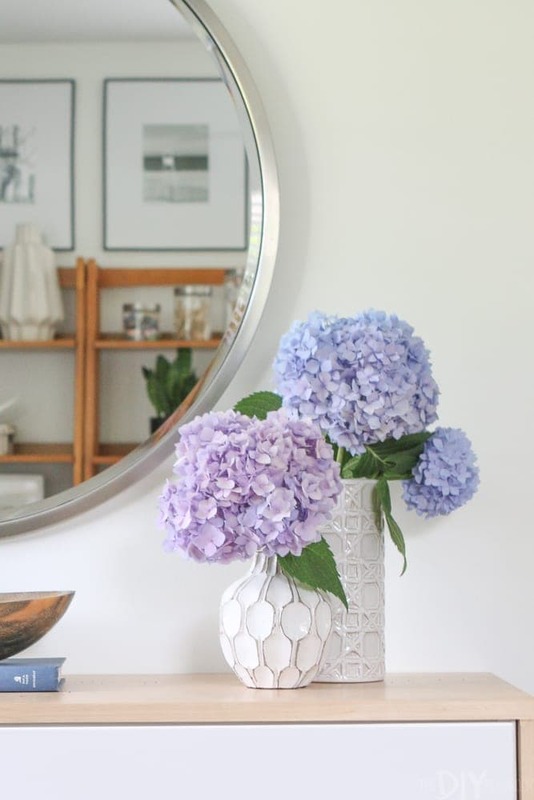 I’m constantly going outside to clip their blooms and bring them inside to display or to bring them to others as a hostess gift. The only reason they didn’t get a perfect score is the fact that I wish I could manipulate the colors of the blooms a bit more. I’ve tried using the pH stuff and I think it made some difference, but I wish the blooms were more blue and a little less purple. But hey, I know that’s me being way too picky! 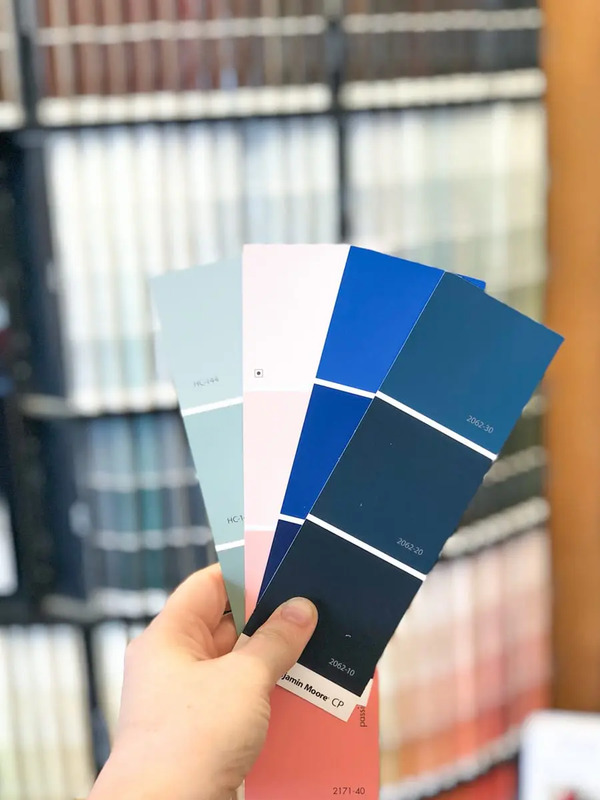 Although our home doesn’t have quite as much teal/blue as it did when we first started our homeowner journey, I’m still really happy with the decision to paint our door Benjamin Moore’s Covington Blue. When I turn onto our block and spot our house the first thing I notice is the blue door, and I feel like our whole house seems “happier” because of it. 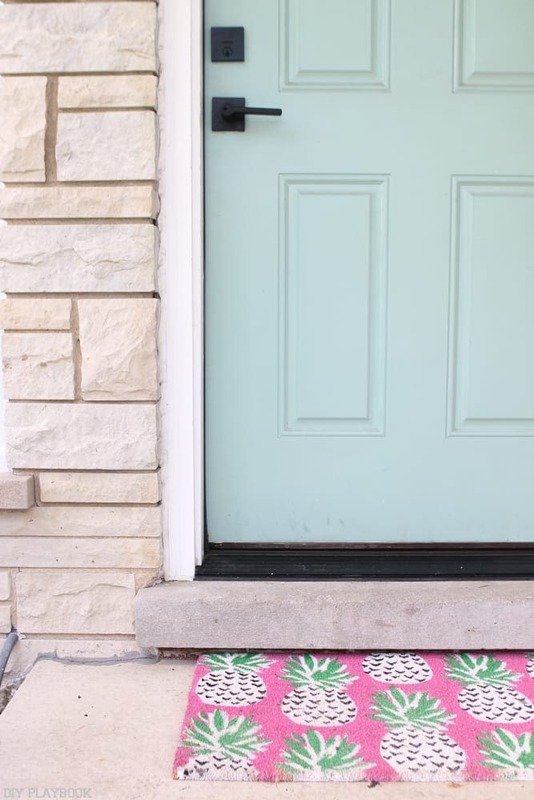 I don’t know if I’ll repeat this exact color again in our next house, but what I do know is that I definitely want a colored door in any of my future homes. 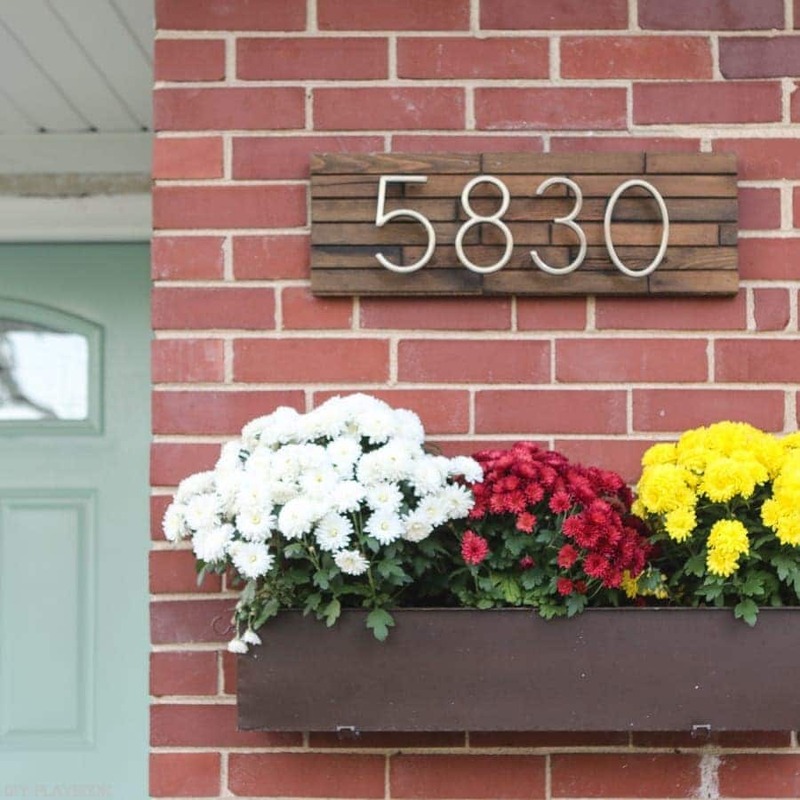 It’s a small touch that makes such a big difference in curb appeal and adding some personal style! 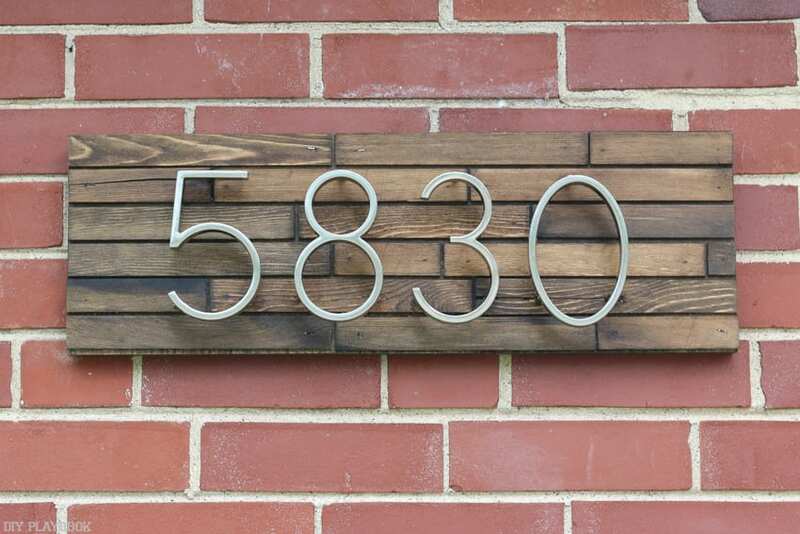 I made this DIY address sign out of old paint sticks last year and still LOVE it. Much to my surprise, this simple and affordable project has become one of our most popular projects here on the blog! The DIY Address sign has been braving the elements for a year now and looks pretty much the same as it did the day I hung it up. Plus I get lots of compliments on this project from our visitors, which I didn’t anticipate since it was such a tiny upgrade. I would definitely do this project again at our next house! 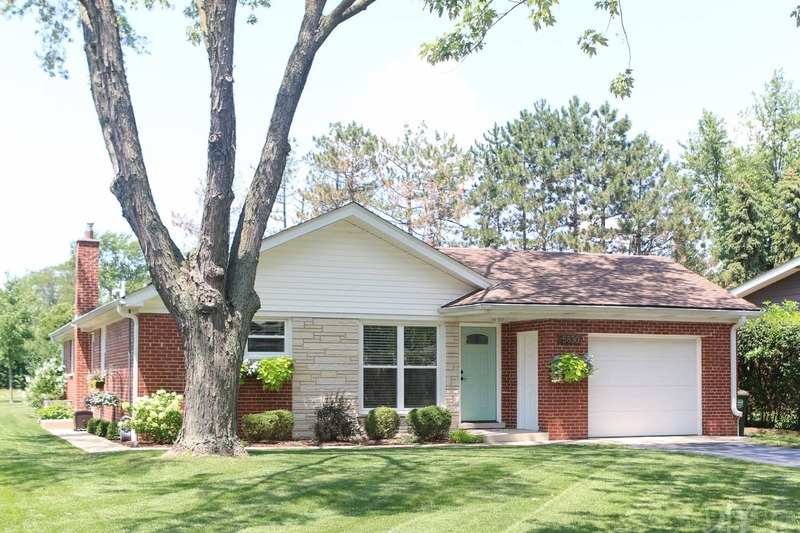 Casey and I plan to tackle a DIY solution to hide this eyesore and I can’t wait to get started. Our plan is to DIY it over the next month so hopefully you won’t have to wait too long for updates! I’m pretty confident it won’t be too difficult of a project and won’t even cost a lot of money. 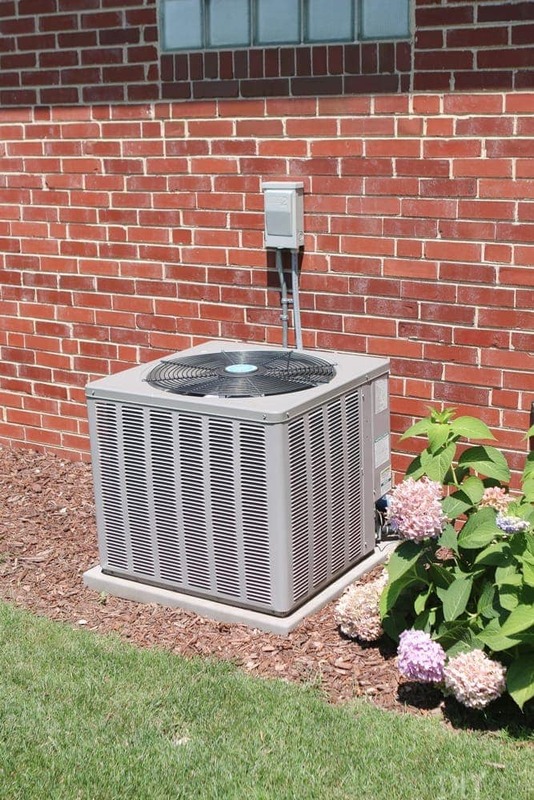 If you’ve tackled anything similar at your own home, we’d love to hear your tips before we get started!